One of the most annoying things that can happen to your computer monitor is a dead pixel. What’s more annooying then that, except multiple dead pixels! In the times of CRT monitors, dead pixels could be fixed by repairing the screen, but if you have got a dead pixel on a LCD monitor, the only solution is to buy a new one. Not any more. You can try UDPixel, a new free software to fix dead pixels on LCD monitor screens. To start using UDPixel to repair dead pixels on your LCD monitor screen, you first need to install the latest version .NET framework on your computer. You can find the version of .NET framework on your computer easily. Once you have a compatible version of .NET framework, download and install UDPixel from this link. 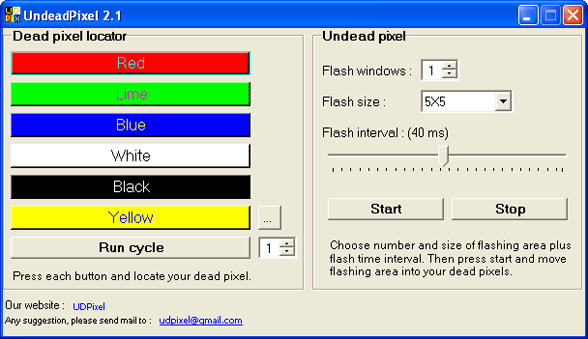 Once you have installed UDPixel, run it and then press the button for each color once to locate the dead pixels on your screen. For example, if you press the red button, it will make the whole screen red helping you to find the dead pixels instantly. Now choose the number of flash windows, flash window size and flash interval values. Then click on start. You will get a flashing box of the size you have defined. Drag this box over the dead pixel and keep it there for few hours. UDPixel will now work with the controls of LCD switches resonantly to fix the stuck or dead pixels on the LCD screen. Note: You need to put the ‘LCD response time value’ in the flash interval box. If you don’t know this value for your LCD monitor, you can set this value to 25ms to start. Check out the video below where I show you how to find and fix the dead pixels on your LCD monitor screen using the UDPixel tool. In the video demo of UDPixel above, I place the flashing box at a random location on your LCD screen as I don’t have any dead or stuck pixel(s) right now. But you need to place it exactly over the dead pixel on your LCD monitor screen. Also, note that UDPixel may or may not fix the dead pixles on your LCD monitor, but must try it once before you decide to spend the money on a new LCD. Since UDPixel runs over .NET framework virtual machine, it works only on Windows. So, if you have a computer running Mac or Linux operating systems, you can either connect your LCD monitor to a windows computer to fix the dead pixels, or you can run windows in a virtual machine software like VMWare to use this software.